As a Young Officer slogging around Dartmoor Training Areas, wet, cold and in desperate need of a caffeine fix, little did I imagine that 26 years later I’d be choosing to run on similar areas for fun. However, recently I was one of 900 endurance runners who descended on the Tank Museum at Bovington, ready for the inaugural Bovington Marathon and Half Marathon. As the stewards of the Defence training estate, DIO teams have to balance the needs of Defence with those of the environment and an obligation to facilitate other users of the estate where possible. Sometimes that may be general open access, only restricting where it’s not safe for members of the public to be on the training estate. Other times we’re closed and only allow public or managed access where we can demonstrate that it is safe to do so. 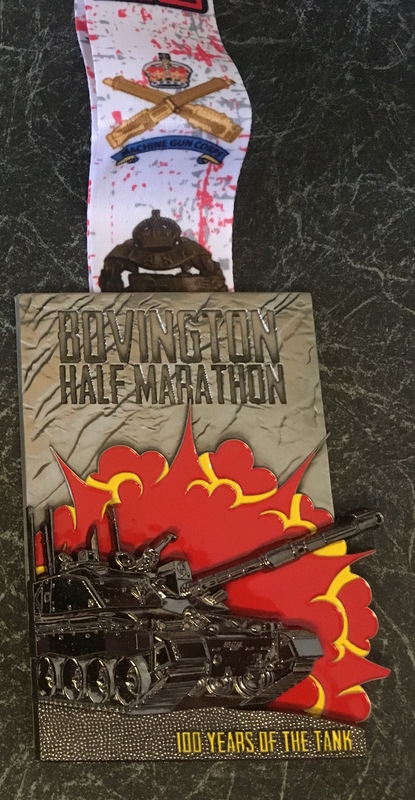 So the Race Director had a bit of a challenge; fitting a Marathon and a Half Marathon onto the Armour Training Area with a very short time to mark the route and then clear the area afterwards leaving no trace of our presence. 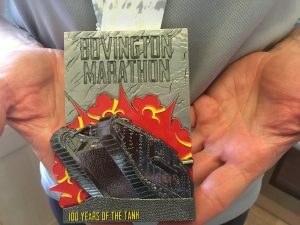 The race plan had to demonstrate the assurance of the health and safety of the runners, marshals and aid stations and how the environmentally sensitive nature of much of the range would be protected as well as maintaining the security of the training area. Right up until the day before, there was always the risk that military requirements would intervene and the races may not be able to go ahead. The Race Director worked closely with our colleagues in Service Delivery Training to make sure that the needs of Defence were met and each of the runners had an outstanding experience. After all of the build-up I arrived at the Armour Centre on a misty morning, ready to head out. There were many familiar faces in the crowd with the Marathon starting an hour before the Half started. Time for a pre-race coffee and brief that included gems like “if you see something shiny and metallic, don’t touch it, it might explode”. Looking around, there were a lot of themed outfits with copious amounts of camouflage on display as well as cardboard tanks. As you would expect, the 13.1ish miles of the Half were tough. To the South of the barracks the terrain is heavily forested and after a fairly brief period of flat ground we started to climb steadily, wrapping round the domestic site and approaching the main tracked training area. As the sun burned off the mist, the views started to open up and we moved from forest tracks underfoot to softer, thicker mud that bound up even the most aggressive of trail running shoes. The race managed to pack in a good mix of terrain, a lot of climbing and some good fast descents. 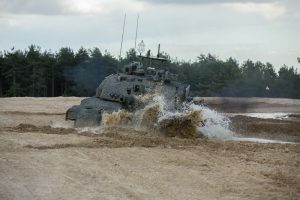 We were challenged to spot the old tanks around the training area, and even found time to stop at the aid stations to enjoy the views while refuelling with cake and cider and chatting with fellow runners. A fun race, tough, friendly and with the opportunity to run somewhere that’s normally closed to the public. The touchstone of whether we’re successful or not is whether the event worked. Feedback on the event, and the location, has been extremely good, and I’ll close with a few words from Race Director, Andy: “White Star Running was exceptionally pleased and honoured to be able to use the training ground. The training area is an interesting place to run, varied terrain, and at times difficult under foot but never boring each area is quite different and unspoiled. The races were pretty tough and I think some of our runners were pretty surprised (for some reason, not sure they read the brief) how hard some of the course was going to be. We are grateful to DIO's Arthur Cargill for making this happen and team from Landmarc for all their help”.